KERA News is building an initiative to cover mental health, and reporter Syeda Hasan is leading the effort. The station began focusing on the issue in 2013. Shortly after the mass shooting in Newtown, Connecticut, KERA launched a project called Erasing the Stigma with The Dallas Morning News and the Dallas mayor’s office. It was the beginning of a years-long focus on mental health, which continues today. KERA's mental health coverage is funded in part by the Donna Wilhelm Family Fund and the Hersh Foundation. 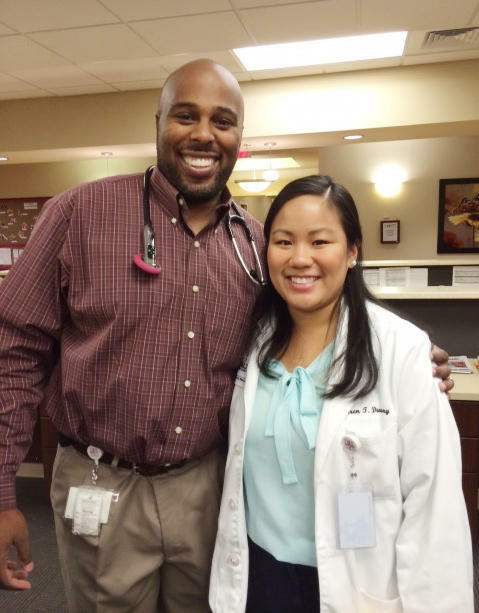 In her third year of medical school, Karen Duong found herself on the other side of Texas. She had driven 12 hours north from where she grew up on the Gulf Coast to a panhandle town called Hereford. "Hereford is known for being the beef capital of the world," she says, laughing. "There's definitely more cows than people out there." Imagine trusting a stranger to make your financial decisions. For some North Texans, that’s the best possible reality. The “representative payee program” helps mentally ill adults manage Social Security benefits. It helps people pay their bills. And when done right, it builds a bond between volunteers and vulnerable citizens. One of the state’s oldest residential treatment centers for people with mental illness could lose its federal funding on Tuesday. Timberlawn Mental Health System, a Pennsylvania-based chain that’s been in Dallas since 1917, is in trouble with regulators for violating patient care and safety. A study released in the journal Circulation found young and middle-aged women can have a harder time in various ways recovering from a heart attack than men. The study also found the poorer recovery was due in part to greater stress among women. State lawmakers are poised to consider scrapping the longtime pilot program NorthSTAR, which provides mental health care to lower income residents in seven North Texas counties. While psychopaths reportedly make up about 1 percent of the country, they occupy nearly 4 percent of its management positions. These figures are part of a study co-authored by Craig Neumann, a professor of psychology at the University of North Texas. He talks about what this means, and how it could affect the workplace. The state moves forward today on a project to improve mental health services for veterans. For the last four years, thousands of volunteer attorneys in Texas have provided free legal services to more than 13,000 low-income veterans and their spouses. The Tarrant County chapter of the non-profit Texas Lawyers for Texas Veterans has served more than 1500 veterans. And the demand has increased by 25 percent since it started in 2010. A federal civil rights complaint was filed Thursday against the city of Dallas and the Dallas Police Department. The group Dallas Communities Organizing for Change wants the Justice Department to investigate use of excessive force by Dallas police officers. A new wing at Texas Health Arlington will take adolescents, adults, and the elderly battling mental health problems like substance abuse, stress, anxiety and severe depression. How do you know if you’re going crazy? It may sound like a funny question, but it’s one that psychiatrists seriously consider every day. Today on Think, Dr. Joel Gold talked about how he works through the possibility. Gold says diagnosis is often a matter of perspective. Here’s a question. Do you know the difference between your amygdala and the hippocampus? There’s a group of 3 year olds in Oak Cliff who do. And soon, pre-K children in Fort Worth may know, too. The district is teaming up with Momentous Institute in a new partnership aimed at teaching young children how to take care of their social and emotional health. About one in four adults has a diagnosable mental disorder in any given year, according to the National Institute of Mental Health. In 2013, KERA teamed up with Mayor Mike Rawlings and the Dallas Morning News for “Erasing the Stigma,” a symposium that looked at how the community work together to better identify and help young adults struggling with mental illness. Documents Detail Dan Patrick's Mental Health History, But Will Voters Care? Update: On Friday night, Jerry Patterson, an ally of Lt. Governor David Dewhurst, released new court documents that suggest Dan Patrick -- Dewhurst’s GOP opponent -- was treated for attempted suicide and more serious psychiatric conditions in the 1980s than Patrick had acknowledged. In this week’s installment of Vital Signs, a new study challenging the idea of simply staying active and engaged to keep aging minds sharp. Researchers at U-T Dallas found activities like reading, socializing or word games aren’t enough. Learning new, mentally challenging skills produced more benefit. Update, 4:56 p.m. Thursday: The Dallas police officer who shot a mentally ill man in a disputed incident caught on tape has been fired, the department announced this afternoon. Cardan Spencer faced a disciplinary hearing Thursday morning. He has also been charged with aggravated assault. Dallas police have opened a criminal investigation and placed an officer on indefinite administrative leave after he shot and wounded a mentally ill man. A police report says Officer Cardan Spencer fired on 52-year-old Bobby Gerald Bennett in Rylie after he walked toward police with a “knife raised in an aggressive manner.” But surveillance video shows a different story. On 'Think': How Does Criminal Justice System Address Mental Illness? How are the courts and mental health service providers working to address mental illness in the criminal justice system? That was the topic of today’s “Think” at 1 p.m. on KERA-FM, 90.1. “Think” host Krys Boyd discussed the issue with Pete Earley, author of “Crazy: A Father’s Search Through America’s Mental Health Madness” and Ron Stretcher, director of criminal justice for Dallas County. Research shows high rates of depression among patients with chronic illnesses. It’s best to treat them both at the same time, but that can present problems for hospitals. Dr. Radha Kambhampati is Medical Director of Behavioral Health for Baylor Health Care System. It opened facilities in Garland and Irving in 2013 to address this issue. He talks about it in this edition of Vital Signs. Spotlight, But Little Cash, For Mental Health Care In U.S. Since the school shooting in Newtown, Connecticut, mental health has made headlines nationally and locally. For a time, it seemed like everyone was talking about the importance of mental health care -- from politicians like President Obama and Dallas Mayor Mike Rawlings to stars like Demi Lovato and Bradley Cooper. But spending on mental health is seriously lagging behind when compared to other medical conditions. As Catherine Rampell of the New York Times reports, direct mental health spending in the U.S. has remained roughly 1 percent of the economy since 1986, while total health spending climbed from about 10 percent of gross domestic product in 1986 to nearly 17 percent in 2009. Hundreds of mental health specialists from across the state are gathered today in Downtown Dallas for the 28th Annual Texas Council of Mental Health Centers Conference. One of the toughest things about dealing with depression can be finding the right medication. It can take months, even years. As part of KERA’s Breakthroughs project, here’s a look at one woman’s struggle and the North Texas doctor who hopes to make the medication matching process less like trial and error. May 12th through May 18th is National Women’s Health Week. And it’s a good time to clarify how the Affordable Care Act impacts women.